Angular cheilitis is a highly discomforting inflammatory condition of the face that is often chronic in nature. Read and know all about the causes, symptoms, diagnosis and treatment of this disorder. 1 What is Angular cheilitis? 3 What Causes Angular cheilitis? 8 Is Angular Cheilitis Contagious? It is an inflammatory condition that leads to the development of swollen bumps and painful cracks at the corners of the mouth. The lesions are usually painless in nature. 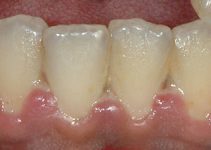 The condition is initially characterized by the formation of deep cracks or slits at one or both corners of the mouth. If is often found to be bilateral in nature. In acute cases, there may be some bleeding from the splits. This usually occurs when the mouth is opened. The skin of the lip thickens due to this disorder and the red junction of the skin and the lip suffers a whitish discoloration. The condition also causes redness and formation of crusts or shallow ulcers. Scales may also develop on the lips. Affected individuals commonly suffer from itchiness around the crusts which eventually form into scabs. In later stages, the lesions may release pus. Patients of this disorder generally experience pain during activities that involve the mouth, such as talking, eating or even smiling. The condition may also give rise to Sclerosis, a disorder that involves pathological thickening or hardening of tissues. Deficiency of iron, zinc or riboflavin can increase susceptibility to this disease. Fungal infections are considered to be a major cause for this disorder, although bacterial infections are also held responsible. If one of the cracks becomes deeper, it can be a site for growth of bacteria or fungus thus worsening the problem. Candida albicans or thrush may begin to develop in the splits, thus resulting in multifarious problems. The disorder can also indicate that the patient is suffering from any disorder caused by malnutrition, such as anorexia nervosa or bulimia nervosa. Persistent vomiting for a long period makes a patient open and close mouth at irregular intervals. The contents of the stomach that are ejected are also half-digested. This can make the corners of the mouth damp and make them prone to infection. The condition may also arise due to loss of teeth, which is common in elderly people. Lack of support offered to the mouth by the teeth makes individuals suffer from over-closure of mouth. This can give rise to cheilosis in elderly people. Poorly-fitting dentures can also lead to Angular cheilitis in older people. If dentures do not fit accurately, it can result in an accumulation of saliva in the corners of the mouth. This can create a perfect environment for the development of the disorder. Elderly people also bite excessively to make their dentures fit in. This can also increase the quanity of saliva. The disorder is primarily diagnosed by a thorough observation of the physical symptoms. Doctors check whether there are cracks in the corner of the mouth. Other symptoms, such as lesions, redness, inflammation and tenderness are also observed. Patients are asked whether they are experiencing any painful symptoms. In older people, doctors may analyze whether loss of teeth or ill-fitting dentures are a cause of the condition. In both young and old patients, blood tests and other examinations may be conducted to determine whether a deficiency of vitamin or other minerals is the underlying cause. This involves use of medicines. 5-fluoroucil and Imioquimod are two of the most effective medications for minor cases of this disorder. 5-fluoroucil blocks DNA synthesis and makes the disease resolve completely. However, it takes anywhere from 15-30 days to show results and also gives rise to some initial side-effects like burning, redness and eroding of lesions. Imioquimod stimulates an immune response in the skin. This results in an erosion and death of the epidermal growth and subsidence of the rash on lips. It also helps avoid any recurrence of the blisters. In mild cases, over-the-counter medications such as Vitamin E oil, lip balms and topical antifungal drugs like Clotrimazole, Econazole or Nystatin may be enough to cure the problem. Lotions and creams should be avoided as these add a lot of moisture and can compound the problems caused by the condition. It must be remembered that the disease itself results from a damp environment that is likely to breed bacteria and fungus. Antibiotics, fungicides and topical medications help alleviate the symptoms, though only for a short time. It is important to address the underlying cause to help long-term cure of the disease and also prevent recurrence of its symptoms. It is needed in more severe cases that do not respond enough to medications. Invasive cure involves procedures like electrosurgery and cryosurgery. Electrosurgery requires local anesthesia and involves use of electrical devices for the removal of the lesions. Cryosurgery requires spraying liquid nitrogen on the lesions to destroy the underlying tissues. The process is highly effective for Actinic cheilitis but can cause some pain, especially if used for treating the entire lip. Both these invasive techniques can damage surrounding tissues, retard healing rate and cause formation of scars. Know about some home remedies for this condition. Add green leafy vegetables, legumes, carrot, tomatoes, spinach and other nutritious foods into your diet. This will help restore the level of vitamins and other minerals in your body. A lack of these substances can make you susceptible to bacterial and fungal infections, which is considered to be a major cause for this condition. Buy a few Vitamin E capsules and draw out its contents with a sterilized needle. Squeeze vitamin E into your lesions to ensure quick healing. Angular cheilitis often results from a deficiency of Vitamin B. Consuming supplements for vitamin B-12 (Cyanocobalamin), vitamin B-6 (Pyridoxine), vitamin B-2 (Riboflavin) or vitamin B-3 (Niacin) can help you recover quickly. This of course, can be useful only if you have a deficiency of Vitamin B. Drink at least eight glasses of water every day. This will ensure that your body stays hydrated. You can use a straw to drink water so that the affected area stays dry. You may also apply honey or aloe vera onto the area. These work as powerful natural remedies for the condition. This is not a contagious condition. However, it is mistaken as one due to the reason that cold sores, syphilis and AIDS often make themselves apparent in the same way. 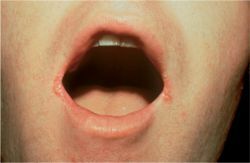 Angular Cheilitis may also develop due to an immune system weakened by HIV. The disorder usually arises in the initial stages of HIV infection. Many HIV patients with this disease also exhibit an associated Xerostomia. In HIV negative individuals, the disorder is usually associated to patients who overclose. It is also related to a loss of the vertical dimension. Cracked mouth corners, one of the most primary symptoms of Angular Cheilitis, is primarly cured by 1% hydro-cortisone cream. In some cases, however, physicians may prescribe antifungal creams like Mycostatin-ll. Mycolog-II is another most widely prescribed creams for the condition. It is a combination of a steroid (Triamcinolone acetonide) and a powerful antifungal (Nystatin). Nystatin destroys the fungus while Triamcinolone acetonide helps alleviate the symptoms of Angular Cheilitis. However, the steroids contained in the cream can produce some side effects on entering the body. If you apply the cream near the mouth, ensure that it does not come in contact with the food that you eat. Put a pinch of baking soda over the affected spots. Baking soda (Sodium Bicarbonate) has been reported to yield great results for lesions on the mouth. If you are not allergic to milk, this can be an effective remedy for you. Cow’s milk contains certain enzymes that help destroy bacteria. Consuming milk daily can help you make a fast recovery if the condition results from an infection. Neem leaves work as a powerful cure for a number of ailments. Apply powdered neem leaves on the affected spot. This will help cure the region naturally. Cucumber has a smooth, cooling effect. Cut a piece of cucumber into small slices and gently rub these on the lips and other affected spots. The coolness of this vegetable reduces pain and irritation. Rub unsalted butter or cocoa butter into the region. Applying it over cracked or scaled lips can accelerate the healing process. Unless treated in time, the condition may leave red spots or scars on the face of patients. This can be prevented by the use of proper medications, which include creams and gels. If the condition results from an infection, doctors can prescribe Terrasil. This is a very effective healing gel that cures infection and relieves swelling. It promotes flow of blood to repair cracked skin regions very quickly. This prevents development of scars. It is important to take care of these lesions in the very early stages. The more the lesions persist, the higher is the chance of scar formation in the affected skin spots. The scars may take a long time to go away. Naturally, it is better to get rid of the lesions as soon as possible to avoid permanent formation of scars. Scars resulting from this condition are extremely displeasing to look at and can be extremely damaging for the self esteem of a person. All these problems mainly arise due to malnutrition and poor diet. In babies, it may arise due to accumulation of excess saliva around the mouth. Moist angles of the mouth favor infection and cause Angular Cheilitis. The condition is usually treated by antifungal drugs, topical medications and dietary modifications. 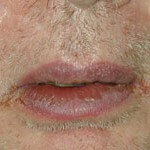 Take a look at these Angular Cheilitis photos to know about the physical appearance of this condition. Check out these Angular Cheilitis images to see how the physical symptoms produced by this disorder look like. If you suspect yourself to be suffering from symptoms of Angular Cheilitis, immediately get in touch with your healthcare provider. Seeking early medical attention can help you make a faster recovery from the disease and avoid complications like scarring and worsening of infections.